A full remake of Pokémon: Gold & Silver Version for the Nintendo DS. The graphics and sound have been completely remade in 3D. 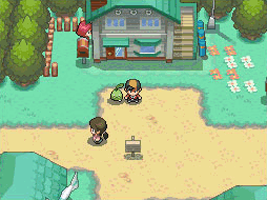 You can choose to have any Pokémon from your team follow you on the overworld or transfer them to the Poké Walker accessory to train them while walking. There are new regions to explore, and the game supports linking and trading with Pokémon: Diamond & Pearl Version. "Want to be a winner is you?" This also appeared in the Game Boy Color version. "You won? The winner is you?" Once you get all 16 badges, speak to the Game Freak sound designer and he will give you the GB Sounds item. It appears as an original model Game Boy with headphones. It changes the music in the game to sound like the original Game Boy versions. The hero of the game has a Wii in his or her bedroom.